Happy World Oceans Day! Did you know this internationally celebrated sister day to Earth Day came from Canada? The Government of Canada proposed the concept of World Ocean Day in 1992 at the Earth Summit in Rio de Janeiro and the day has been celebrated internationally ever since. As of 2009, June 8 has been officially declared by the United Nations as "World Oceans Day." It's a day to remember the life-giving role of our oceans. Did you know 80% of the oxygen we breathe comes from oceans? From consuming sustainable seafood and cleaning up garbage on the beach to wearing biodegradable sunscreen and choosing reusable water bottles, shopping bags and food containers to keep plastic out of our seas, there's plenty of ways we can all help conserve this vital resource. This is the time to celebrate our sea and here are three ways to do it in Vancouver this weekend. World Oceans Day Aquarium Celebration - Friday, June 8th, 11am-4pm, Vancouver Aquarium, Presentations & hands-on activities plus cake at 2:15pm! World Oceans Day Dinner - Friday, June 8th, Yew Restaurant, Four Seasons Hotel, Vancouver, Menu inspired by the oceans of the world, cocktail reception starts at 6:30pm. 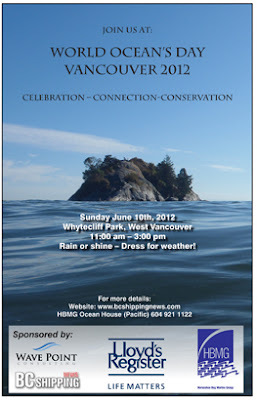 World Oceans Day 2012 Vancouver Event - Sunday, June 10th 11am-3pm, Whytecliffe Park, West Vancouver. Celebration, Connection, Conservation. Why Use Non-Toxic, Water-Based Nail Polish? What Does Sunscreen SPF Really Mean?